The Freedonia Group predicts that drone shipments to government will rise from 1,400 units in 2015 to 9,030 units in 2025. Government spending for drones and other unmanned aerial vehicles (UAVs) will grow from $100 million in 2015 to $250 million in 2025, predicts The Freedonia Group in its study Number 3408. Drone shipments to government will rise from 1,400 units in 2015 to 9,030 units in 2025. Federal agency spending on drones will grow from $90 million in 2015 to $170 million in 2025. Go here for details on the Freedonia drone report. Freedonia analysts say “The state and local government market for drones is expected to quadruple to $40 million in 2020, outperforming federal government demand, but remaining extremely modest in size.” The Freedonia report notes the efficiencies that drones can bring to inspecting bridge decks and completing search and rescue operations. GPN recently spotlighted how the Gwinnett County, Ga., police department (GCPD) has expanded its accident investigation technology with the addition of a drone. Officers in the department rely on the small unmanned aircraft systems (UAS) to fly over accident and incident scenes and record pictures and video. The drone, says department staff, gives officers a more comprehensive view. The drone also reduces time needed for investigations. “We’re able to launch this thing, and within five minutes have pictures of the entire scene,” says Lt. Chris Smith of the GCPD. Go here for the GPN posting. A simple, ready-to-fly system that governments should consider is the Inspire 1 from DJI. It is powerful yet lightweight, and provides good stability a government operation needs. As drone consultant Matt Sloane explained in a recent GPN post: “It has the ability to carry and drop payloads (a life jacket, a radio, etc. ), and can withstand up to 40-mile-per-hour winds.” Sloane is CEO of Decatur, Ga.-based Skyfire Consulting. Go here for Matt Sloane’s views at the GPN site. Carbon fiber arms give the Inspire 1 the strength to easily maneuver in the air. The arms move out of the camera’s way at the flick of a switch. With a full 360-degree unobstructed view, operators have the freedom to capture shots independent of the direction they are flying. The unit’s new 13-inch quick-release rotors are built with the proprietary DJI “Z-Blade” design. They have been reinforced with a carbon fiber compound material to ensure good performance with increased stability. The unit’s fully integrated intelligent battery powers the Inspire 1 and virtually manages performance. When in flight, the unit’s remaining battery power is shown live, letting you know how long you the unit can stay in flight. 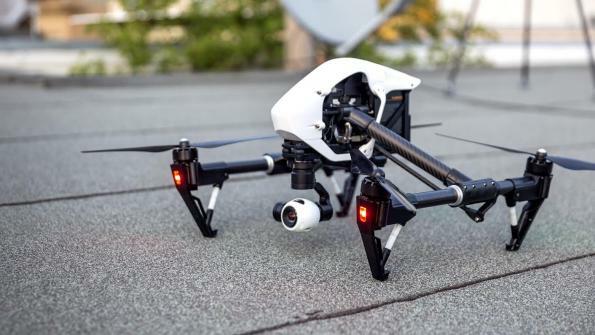 In the video, the DJI’s Inspire 1 Quadcopter gets a test run. Eric Cheng, DJI’s Director of Aerial Imaging, outlines some of the product’s features.